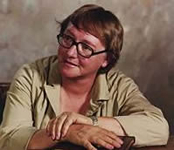 Marion Zimmer Bradley is best known in the fantasy world for The Mists of Avalon, but her largest work is her epic science fiction series Darkover. 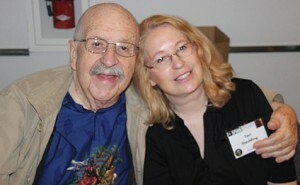 Bradley also wrote many short stories, stand-alones, anthologies, non-fiction works, and a Fantasy Literature magazine. 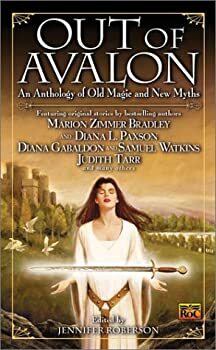 The Mists of Avalon — (1979-2007) The Arthurian Legend from the feminist and pagan perspective. The Mists of Avalon is the original book. The later prequels were co-authored with Diana Paxson. They are listed here in order of publication, but here is the order if you want to read them in order of when the events occurred in Avalon: Ancestors, Ravens, Forest, Lady, Priestess. The Mists of Avalon, as you’ve likely guessed, is a retake on the King Arthur legends, but what makes it different is that it’s written from the women’s perspectives (Morgaine, Guinevere, etc.). The first one was written by Marion Zimmer Bradley in 1983 and this was the first time this feminist technique was used in fantasy literature and it was very successful (I learned that when I took a Modern Scholar course in fantasy literature). Lady of Avalon: Help, I’m lost in the mists of history! 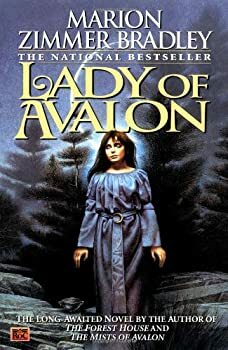 Lady of Avalon is a set of three sort-of-related stories about priestesses on the Druid isle of Avalon, during the centuries preceding Bradley's stunning Mists of Avalon. And they're OK, in general. I especially liked Viviane's story; I learned more about what made that complex character tick. 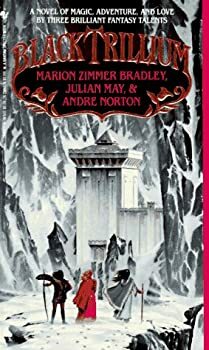 Trillium — (1990-1997) Marion Zimmer Bradley, Julian May, Andre Norton. Publisher: Those with the gift have the power One stormy night, three princesses are born. As each baby is placed into her mother’s arms, so the Archimage Binah bestows on her a gift of great power: a pendant containing a bud of the long-extinct Black Trillium. One day that power will be all that protects the princesses from certain doom. 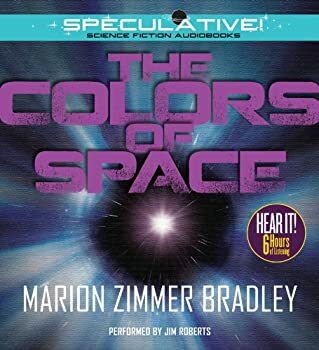 At first glance, Black Trillium looks like an interesting project: three leading female authors of speculative fiction — Marion Zimmer Bradley, Julian May and Andre Norton — writing a book together. After having read it, I don't think the result is a resounding success. It still spawned a total of four sequels written by each of the authors individually. I understand there are some continuity issues between those books, making the SAGA OF THE TRILLIUM series a strange one indeed. Bart Steele has been off at the Space Academy and hasn’t seen his father in years. When he goes to meet him at a Lhari space station, Mr. Steele never shows up. Instead, he sends an agent with a message for Bart. The Lhari, an intelligent alien race, suspect that Bart’s dad has stolen the secret of their warp drive. If so, this means humans will be able to manufacture their own warp drives and the Lhari will no longer have a monopoly on out-of-system space travel. The Lhari are trying to hunt down Mr. Steele and Bart is in danger, too. I'm not a huge fan of Marion Zimmer Bradley, but the Trojan War is one of my favourite subjects, and I was curious to see how it could be told from a singular, feminine point of view — in this case, Princess Kassandra of Troy, tragically famous for her accurate predictions of doom that no one believed. 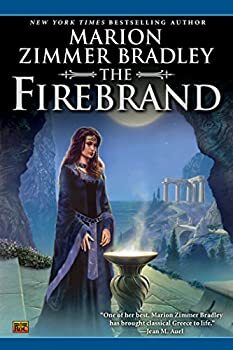 The Firebrand is told with Bradley's trademark style; a strong feminist streak (that can become a little too heavy-handed at times), and her fresh spin on an ancient legend, a technique that brought Bradley into the public eye with her best known novel The Mists of Avalon. 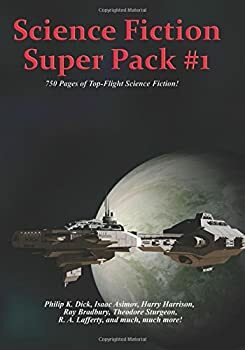 Like the companion fantasy volume, Science Fiction Super Pack #1, edited by Warren Lapine, only has one story I didn't think was good, and it's a piece of Lovecraft fanfiction. H.P. Lovecraft's overwrought prose doesn't do much for me even when Lovecraft himself writes it, and much less so when it's attempted by imitators. And Lovecraft's stories at least have something frightening that happens in them; these two stories (in this volume and the other) only have visions of aspects of the Mythos and crazy people ranting, which isn't scary or interesting. Everything else was good, occasionally even amazing. CLICK HERE FOR MORE DARKOVER STORIES. Claire Moffatt — (1972-1990) Horror. Publisher: The townspeople said Sara Latimer was a witch — just like her Great Aunt Sara before her. All Sara Latimers were witches. And Sara felt the power stirring within her. Would she embrace it, or would her love for Brian drive all darkness from her soul? Hunters of the Red Moon — (1973) Publisher: For the Hunters, the Hunt was a religion. The Sacred Prey, sentient beings collected from all over the galaxy, were literally given a fighting chance — they were allowed to choose weapons from an armory with every imaginable weapon and given time to train. Then they were taken to the place of the Hunt, where death awaited them. Those who survived until the eclipse of the red moon, however, were honored by the Hunters and rewarded with all the wealth they could desire. The trick, of course, was surviving. The Atlantean Chronicles (Web of Light) — (1982-1983) Publisher: Before there was Avalon, there was Atlantis. Domaris, disciple of the Temple of Light, was wrenched from her peaceful life by the arrival of Micon, the Atlantean prince, whose powers over wind and sun, earth and fire, are coveted by the sorcerers of the dark who would harness his gifts for their own evil ends..Soon, out of a tender, earthly passion, would rise forces that might decide the final victory. For soon Domaris would bear Micon a son — but Deoris, her sister, would be enthralled by the forces of darkness. 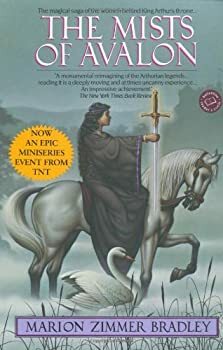 Lythande & The Gratitude of Kings — (1986, 1997) Publisher: She was pledged by sword and spell to forever fight the forces of chaos..; a Pilgrim Adept of the Blue Star, she had mastered all the true magic of the world, but the power of an Adept was always bound to a Secret, and whoever discovered this sorcerer’s Secret could steal away the Blue Star power, leaving the Adept defenseless, fit only for death; and her secret was perhaps the most dangerous of all, setting the magic apart from all humanity, forcing her to war against spell beast, sorcerer, thief, swordsman, and the magic of the gods themselves. CLICK HERE FOR LYTHANDE SHORT STORIES. Light — (1995-1998) Publisher: What is the Truth? Truth Blackburn’s father thought he knew what it was. Thorne Blackburn and his followers settled at Shadow’s Gate, a magnificent old house in upstate New York, and sought the Truth about life through ritual and magic. One night, something went badly wrong during Thorne’s most powerful ceremony. When the chaos had passed, Thorne had vanished, and Katherine, mother of Thorne’s young daughter Truth, was dead. Thirty years later, Truth Blackburn searches for smaller truths: what really happened that night at Shadow’s Gate? Did Thorne truly have magical powers? And what happened to her half-siblings, a boy and girl Truth last saw that horrible night when her mother died? Falcons of Narabedla — (1957) Publisher: Mike Kenscott is having a really bad vacation. One minute he’s camping in the Sierra Mountains with his brother Andy, and the next minute he’s on a different world — or in a different time — or both. He’s also in a different body. Now he’s Adric, Lord of the Crimson Tower, of the Rainbow City of Narabedla. He has to cope with his fellow Narabedlans: the Dreamer Rhys, the mysterious veiled Gamine, the dwarf Idris, his brother Evarin the Toymaker (whose Toys are deadly), and Karamy, the golden witch, who is either his lover or his greatest enemy – with most of both his and Adric’s memories gone, he’s having trouble knowing what she is. Then there are the people outside the city, led by the man called Narayan. Mike/Adric knows that they are important to him, but he desperately needs to remember why. Seven from the Stars — (1961) Publisher: Reidel had been caring for the animals on the colony ship before its destruction. He hadn’t expected to find himself the leader of the survivors. While there were only seven of them, but they were a varied group, both in psi powers and in temperment. He also had to deal with the people on the Closed Planet they had been marooned on… and then there were the enemy aliens to worry about. The Door Through Space — (1961) Publisher: …across half a Galaxy, the Terran Empire maintains its sovereignty with the consent of the governed. It is a peaceful reign, held by compact and not by conquest. Again and again, when rebellion threatens the Terran Peace, the natives of the rebellious world have turned against their own people and sided with the men of Terra; not from fear, but from a sense of dedication. There has never been open war. The battle for these worlds is fought in the minds of a few men who stand between worlds; bound to one world by interest, loyalties and allegiance; bound to the other by love. Such a world is Wolf. Such a man was Race Cargill of the Terran Secret Service. The Brass Dragon — (1969) Publisher: It’s bad enough for a teen-age boy to wake up with amnesia, strange burns on his legs, and even stranger nightmares. But when a creepy stranger claiming to be his father tried to remove him from the hospital, his adventure was just beginning — unless, of course, the adventure had already happened. The Endless Voyage — (1975) aka The Endless Universe. Publisher: Gildoran was an Explorer. Despite the number of planets found and tied into the Transmitter network that enabled everyone else to travel instantly from planet to planet, his home was his Ship, and the only people he could count on were her crew. For Explorers traveled through space to find new planets, and their years were decades or centuries to anyone not on the Ship. As they found and struggled to survive on unknown worlds, the rest of the Galaxy moved on, so when they returned to “civilization” anything could have happened, and the world they left was not the one to which they returned — even if it was on the same planet. The House Between the Worlds — (1980) Publisher: Cameron Fenton participates in a parapsychology study, using an experimental drug. Instead of increasing his ESP, it causes him to leave his his body and enter other worlds. But are they real, or do they exist only in his mind? And if they are real, will he ever be able to get anyone in his world to believe him? Survey Ship — (1980) Publisher: How do you make a spaceman? You start the same way that you start to make a chess master, a ballet dancer, a trapeze performer, or any other difficult and complex task demanding highly trained and concentrated skills, physical or mental; you start when the future professionals are too young to know whether that is what they want out of life, or not. United Nations Expeditionary Planetary Survey — UNEPS — starts every year with one hundred five-year-olds, discovered, in early testing, to be both mentally and physically superior. Twelve years later the best graduates of the Academy are given a Ship and sent out to find habitable planets for humans to live on. But what happens to a small crew of teenagers once the Ship leaves Earth? Warrior Woman — (1985) Publisher: This is not a typical Marion Zimmer Bradley novel. This book is the result of a bet between Marion and Don Wollheim, her editor for the Darkover novels at DAW Books. In addition, it’s her response to the Gor novels – where men were men and women were slaves – that were also being published by DAW Books. Yes, this book does start out with a heroine who has been captured and is being sold as a slave, who has amnesia and remembers nothing of her life before the trip across the desert with the slavers – and, due to a head injury, remembers mercifully little of that. But she does know that she would rather fight in the arena than be a harlot for the men who do, and that choice changes the rest of the book. In a Gor-style novel the woman would become less her own person, eventually learning to be a contented and obedient slave. In this book, even while the heroine, called Zadieyek of Gyre, remains a slave, she is something quite different from the typical ‘slave girl’ – she grows and develops, always searching for her memory and her past, convinced that this is not how her life is supposed to be. And, of course, she’s right. Night’s Daughter — (1985) Publisher: Since time immemorial, when the Serpent-lord coupled in the Great Rite with the Priestess of the Night, the Kingdoms of Light and Dark, of Sun and of Moon have been at war. Now Pamina, daughter of the Starqueen, supreme symbol of the Night, and of Sarastro, King of the Royal House of the Sun, has to choose which of her parents she will follow, in custom and in principle. And together with her lover, the princely Tamino, she must face her Ordeal at the Court of Wisdom, Ordeals of Earth and Air, of Fire and Water, from which none can flinch and none can escape. Bird of Prey — (2012) Publisher: The Toymaker’s fatal toys link a little girl to both her father and her mother’s brother. Glenraven — (1996-1998) Publisher: Sophie, seeking solace after losing a child, and Jay Jay, who wants to get away from it all when her third marriage fails, become unwitting heroes in the magical kingdom of Glenraven when they help its people to overthrow a monster ruler.